Why not make sure that the sun set for your business on another successful day by choosing to send out these wonderful Christmas ecards for business. 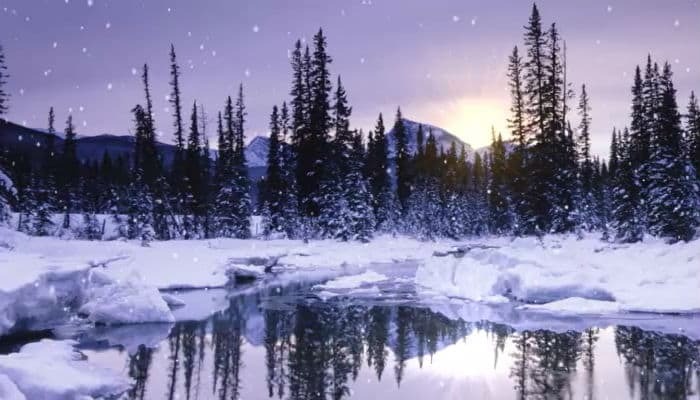 We really love the mixture of the tranquil background scene with our own snow animation and feel that it perfectly encapsulates the true beauty and spirit of Christmas. Another great thing about our ecards is that we not only look to ensure that they are great to look at, but that they also have features that make it a user friendly marketing tool. This is why we have designed our holiday ecards for business to be customisable and also to allow for plenty of space to get your message across in full to your target market. Whether it is to tell them about some of the great festive offers that you have running or perhaps even just wish them the very best of the season, you can be sure that you will not run out of space with our ecards. With this in mind you will want to take the time and put some careful thought into what it is that you want to say and then transfer those words ready to send out to your contacts all with a view of spreading some of that much needed festive holiday spirit; one ecard at a time!